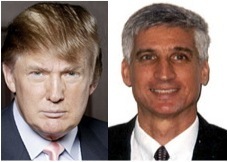 Lawyer Steven Rubin engaged Donald Trump in a heated online bidding war at the end of last month, winning the Emerald Dunes Golf Club in Royal Palm Beach for just over $15 million. The private club, which lost a $16 million foreclosure judgment in March, was sold for $15,000,100 in an online auction May 20. Trump’s bid was $15 million, according to Palm Beach County records. Rubin, a sole practitioner in Boca Raton, specializes in real estate law. He purchased the club through a limited liability corporation, Florida Emerald Dunes Acquisition, from Lehman Brothers Holdings. “I wanted to buy it,” Trump told The Real Deal. “I thought I would go up to $12 million, because I felt it was going to go for $7 or $8 [million].” Trump said he had intended, if successful in the bid, to convert Emerald Dunes into a public course. He said the quality of the course was not high enough to justify keeping it private, however. “I think you could convert it into a really good public course, and I would recommend that to Mr. Rubin. Because it could never be great as a private course, it’s just not good enough,” he said. The $100 difference is a bit deceptive. According to the rules of South Florida’s online foreclosure auctions, bidders must place a maximum bid in advance; if one bid is higher, no matter by how much, it will be listed as being just $100 higher. Rubin’s actual bid was not disclosed. Trump’s maximum placed bid was $15 million. Trump and Rubin were the only bidders other than the bank. The club’s troubles, in fact, began only a few years after it was converted into a private course, after Emerald Dunes Golf Course purchased it in 2005 for $20.4 million. The foreclosure action on the club was first filed in 2009 after Emerald Dunes Golf Course was delinquent on a $15 million loan. Rubin was traveling and could not be reached for comment. 2016 Presidential Election Year Post Script Tidbit: In 1985, Mr. Rubin was involved in litigation in which he represented the Plaintiff in a case heard, in part, by a Federal Judge in New Jersey. The Federal Judge was the Honorable Maryanne Trump Barry, Donald Trump’s sister. In that case, the United States Court of Appeals for the Third Circuit granted the Plaintiff’s Petition for Writ of Mandamus against Judge Barry. See Bloom v. Barry, 755 F. 2d 356 (3d Cir. 1985).